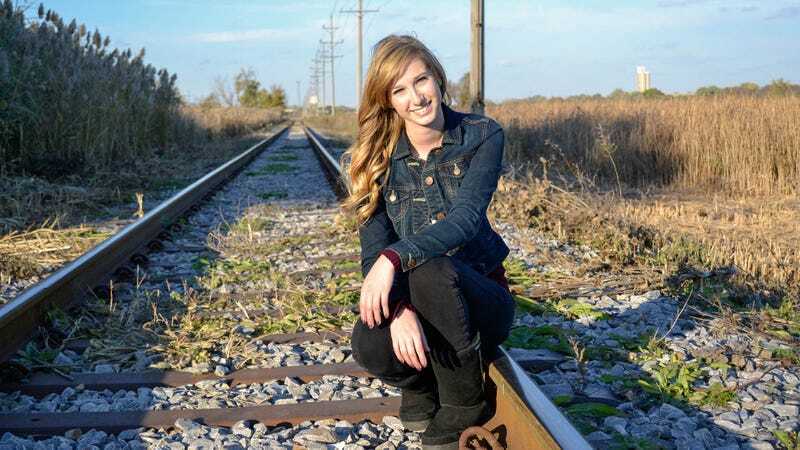 At this point, it’s hard to believe Morgan could possibly get any cooler, but somehow, Alton B. Parker High’s most beloved student has found yet another way to be better than everyone else: Morgan got her friend with a fancy camera to take photos of her by some railroad tracks. Okay, Morgan is just incredible. Who else could pull off something like this? At about 3 p.m. yesterday, Morgan pretty much broke the internet when she uploaded a Facebook album simply titled “:P” that features 15 high-quality photos of herself posing in front of some cool abandoned railroad tracks that Morgan probably learned about from one of her older sister’s friends. Every picture in the jaw-dropping album was taken during the golden hour and has a big watermark on it from “Amanda Marie Photography,” which totally makes Morgan look like a real, professional model even though she’s only 17. Some people are even saying that the “Amanda” who took the photos is a sophomore at NYU who Morgan met on Instagram, and if that’s true, Morgan is not only the coolest person in all of Alton B. Parker High, but she might also just be the coolest person in the world. Whether sitting, standing, or lying down, each one of Morgan’s poses on the railroad tracks looks absolutely perfect, and Morgan just does it in a way that doesn’t feel forced. The crazy thing is, Morgan isn’t even smiling in most of the pictures, but it just makes her look cooler—like she doesn’t know that she’s completely flawless even though she totally is. In one black-and-white image, Morgan is facing away from the camera altogether, just watching the railroad tracks disappear into the distance, and it’s somehow so emotional and iconic it could honestly be on the cover of a poetry book. Morgan’s just that stunning. Wow. We’ll probably never know where Morgan gets the inspiration to be so on point every day of her life, but this epic photoshoot proves she isn’t slowing down anytime soon. We can’t wait to see what Morgan does next, because it’s basically guaranteed to change our lives for the better. You go, Morgan!